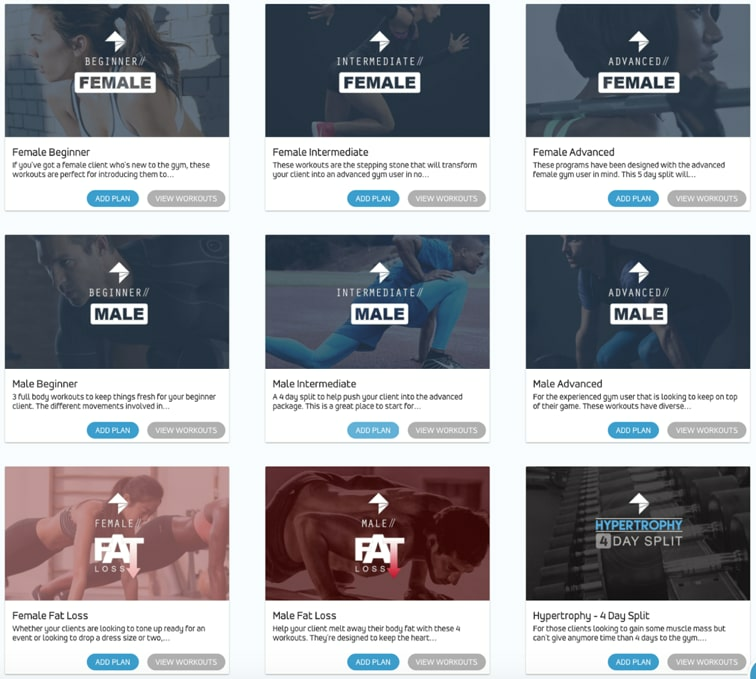 Ideal for personal trainers looking for a web and mobile app to communicate and connect with their clients. My PT Hub is a popular software solution used by more than 55,000 trainers across the globe to help manage clients. The cloud-based web and mobile app's intuitive, user-friendly design helps trainers easily create and monitor customized client programs. My PT Hub's features enable trainers to streamline their workflow so that they can spend less time on administrative tasks, and spend more time with clients. Is My PT Hub the right software for you? My PT Hub is a comprehensive online web and mobile app for personal trainers and fitness professionals who want to provide more value to their clients. The software provides users access to a catalog of over 7,500 exercises and 600,000 food items, and enables trainers to create customized workout and nutrition programs. My PT Hub also provides advanced results tracking capabilities to help keep trainers up to date with their clients' progress, so they can motivate their clients and hold them accountable for their results. Clients can use My PT Hub to log their workouts and nutrition, update their measurements and upload progress photos, all from the app. Offline mode enables trainers and clients to update the software even without an Internet connection. Users can create unlimited training and nutrition plans for clients by choosing from an extensive library of exercises and food items. Conduct assessments, such a PAR-Q, and record vital stats, such as blood pressure, heart rate, and measurements. Engage with clients using the real-time messaging system, progress photos, push notifications, and client notes. Branded app provides a seamless experience for clients and allows trainers to grow their own business. Ability to manage multiple trainers and take one-off or recurring payments. Technical support is via email only (no direct line to call for support if needed). Currently, there is not an option for clients to book their own sessions with trainers. At present, this can only be done via the platform on the trainer side. Software cannot handle class bookings. Paid plans range from $7.50-$12/month (billed annually), depending on the number of clients, workouts, and nutrition plans allowed. Custom branded app available for additional $59-$79 one-time fee, depending on your plan. Special offer for SoftwarePundit readers: Save 30% off your first month (for monthly subscriptions), or 30% off of your first year (for annual subscriptions) when you upgrade your free account to a paid account through our referral link. Alternatively, you can use coupon code "QUINNB30" when upgrading your account to receive this promotion. For many trainers and fitness professionals, managing and communicating with clients can be a manual, time-consuming task. My PT Hub helps simplify this process by providing an affordable solution that works well for both trainers and clients. The software is used by more than 55,000 trainers and fitness professionals around the world to plan, create, and track customized nutrition and workout programs for their clients. My PT Hub offers a comprehensive set of built-in features, including more than 350 workout templates, an intuitive scheduling system, and billing and payment processing capabilities. Trainers can use My PT Hub's cloud-based software to schedule sessions, prepare workouts, review client progress, and communicate with team members anywhere they have an Internet connection. Below, we'll explore My PT Hub's range of features, and how they can help take your training business to the next level. As a trainer or coach, keeping track of your sessions is essential. My PT Hub helps simplify this process by automating and managing sessions through a built-in scheduling system. Trainers can select one-off or recurring sessions for clients, and allocate a specific location, date, and time for each session. Users can also invite several clients to one session to create a group PT class or boot camp. My PT Hub also helps trainers keep track of the number of sessions each client has received, and view how many sessions they have left for pre-purchased packages. When a session is scheduled, clients will receive a push notification with all relevant appointment information, and the session will automatically appear on the client's hub and calendar page. One drawback of the software is that clients are currently not able to book sessions themselves from an online calendar. Instead, trainers and coaches must manually schedule sessions with clients by using the dashboard. A color-coded scheduling calendar provides a quick snapshot of the upcoming week or month. To make things even easier, you have the option to sync your sessions with your existing calendar including iCal, Outlook, Google Calendar and many others. The My PT Hub App allows you to manage your schedule, get real-time updates, create workouts/nutrition plans, and track progress, all from your phone. Whether you’ve just finished a session in the park, or are about to make a home visit, you can stay on top of your business at all times. However, the standard app is not branded for your business—if you want a custom branded app, My PT Hub can provide this for an additional one-time charge of $59 or $79, depending on which plan you purchase. For those looking to improve their customer loyalty, paying for the custom-branded app can be a worthwhile investment. The workout management section is one area where My PT Hub truly excels. 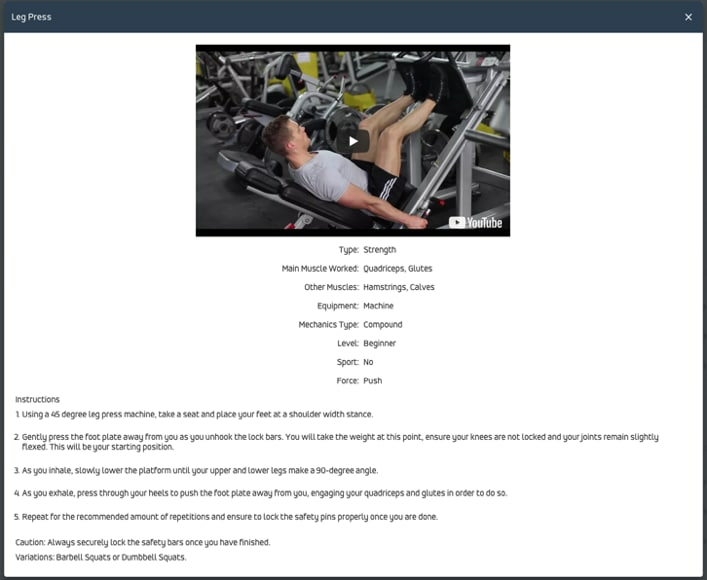 With a library of over 7,500 exercises (including video demonstrations and detailed instructions), trainers can quickly search, create, and allocate customized workouts for clients in a few clicks. If the extensive library is not enough, trainers also have the option to create any type of custom exercise, and can also include images and video if desired. Workouts can be allocated to individual clients or a group of clients, which is particularly useful if you are running a boot camp. 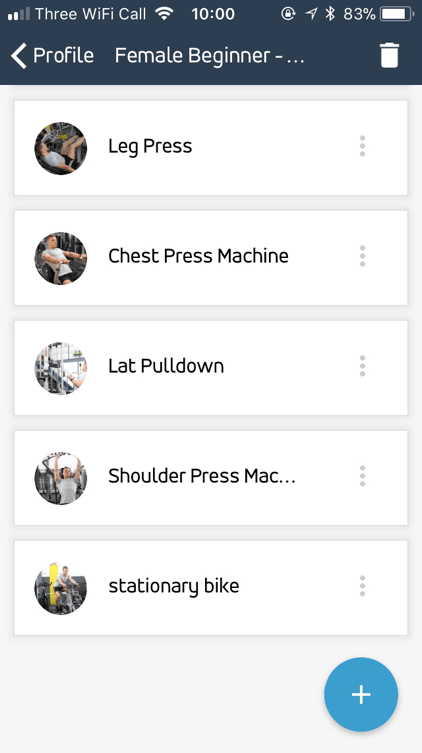 Clients are able to quickly view and record assigned workouts via the mobile app, with the ability to input and record their progress for each exercise (weight, reps, rest). To make things easier, My PT Hub also incorporates more than 30 different pre-made plans with different objectives, including female fat loss, bodyweight, kettlebells, hypertrophy 4-day splits, and many more. When setting up a workout, trainers have the option to select a plan, which can be adjusted according to each client’s needs. 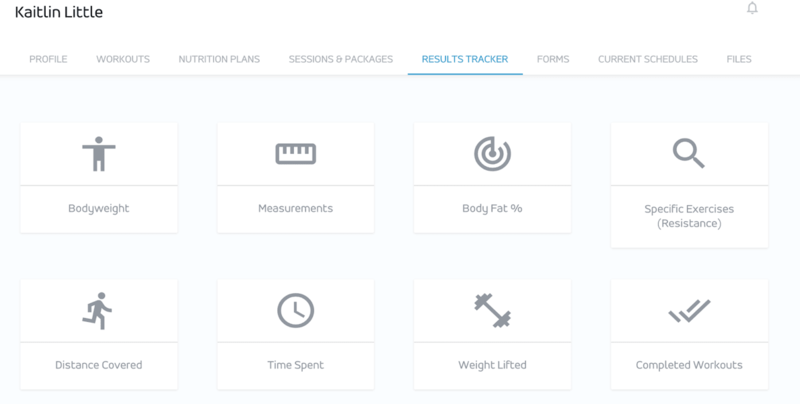 My PT Hub’s advanced nutrition tracking is designed to help trainers easily keep track of their clients’ macros. This feature complements workouts; trainers and nutritionists can quickly create customized plans that meet all of any particular client's goals. With more than 600,000 food items to choose from (supermarket, restaurant, and supplements) in the My PT Hub library, and the option to add custom food items, the software helps make nutrition tracking easier and more accurate. A convenient macro calculator allows trainers to tally the desired macros for clients quickly, simply by entering the client’s current weight, desired weight and level of physical activity. Using this information, My PT Hub will calculate the exact recommended macros required to achieve their goals, and can even generate a shopping list to help meet their macros. The macros are provided as both grams and percents, allowing clients to easily track their proteins, fats and carbs. Meals can be adjusted according to each client’s specific goal, and trainers can also use My PT Hub to leave reference notes. On the client side, adding foods to a nutrition plan can be done quickly via the mobile app. Clients can enter the information manually or scan a barcode to log their nutrition automatically. My PT Hub excels at helping users track their clients' progress and keeping them motivated to achieve their personal goals. The software's advanced results tracking enables clients and trainers to easily view progress over time, including key statistics, measurements, charts and progress pictures. Plus, trainers can check their clients' progress (including important milestones and achievements) through the activity feed, which delivers real-time updates on each client’s workouts and nutrition. My PT Hub also integrates with Fitbit to enable both trainers and clients to view daily steps, calories burned, maximum heart rate, distance covered and much more in their account. Trainers can store clients’ vital stats, including their resting heart rate and blood pressure, in one central location. Personal trainers and health coaches can use My PT Hub's many client tracking features to ensure that they can efficiently check in with their clients, keep them motivated, and celebrate their achievements. My PT Hub also enables trainers to quickly update and motivate clients through the built-in instant messaging system and provide written feedback when their clients log workouts. Users can also give their clients immediate feedback through the new “like” feature in the activity feed. Although the primary purpose of My PT Hub is to provide a platform for workout and nutrition plans, the software also includes functionality for invoices and payments. Trainers can accept payments online, or in person, for their services and products. All major credit and debit cards are accepted, including Visa, Mastercard, and American Express. 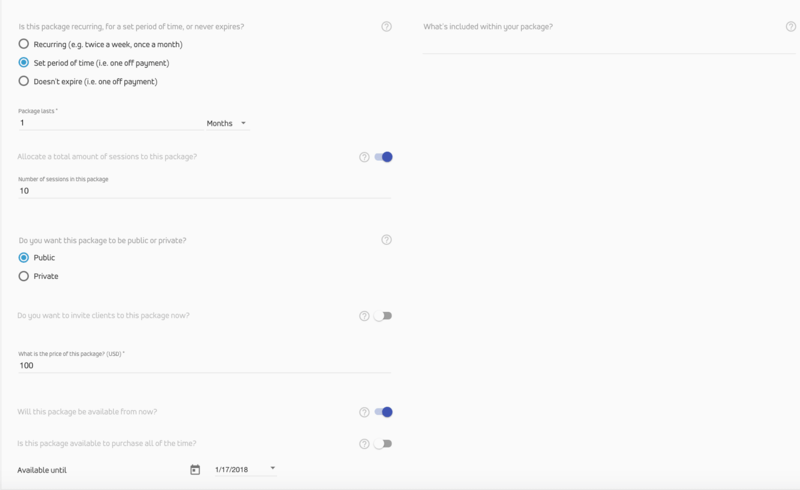 To set up payments, trainers need to create "packages," which are collections of workout plans, nutrition plans, and coaching sessions that a client can purchase. For example, a package may include a predetermined workout/nutrition plan (e.g., male beginner hypertrophy), and 10 coaching sessions. Packages can take the form of recurring payments (e.g., once a month for six months), one-off payments that allow access for a specified time (e.g., available for one month), or one-time payments that provide clients with indefinite access to the purchased package. 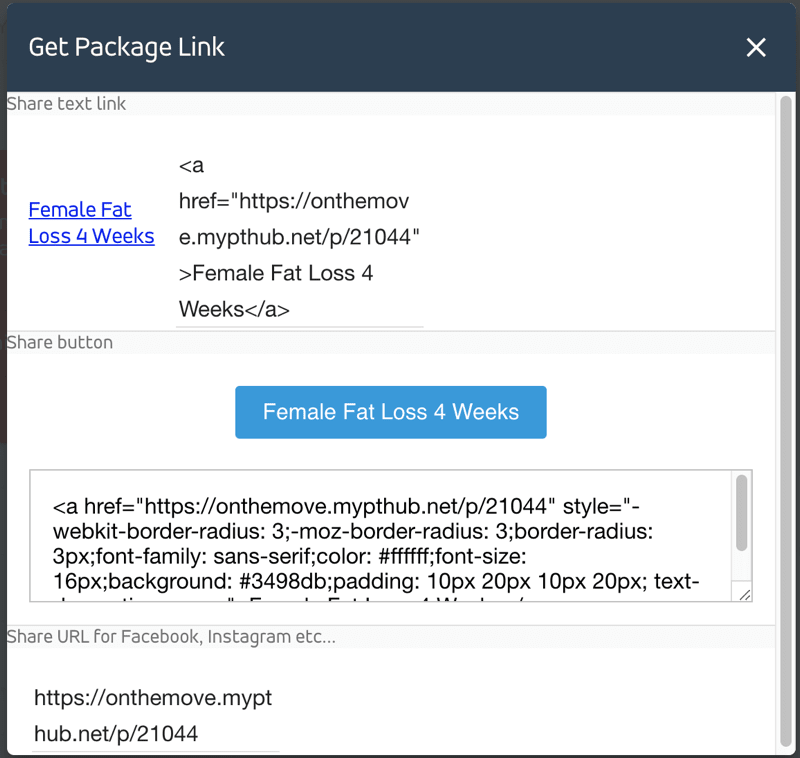 The software also provides the ability to sell packages via social media (Facebook, Instagram, etc. ), through a "Share Text Link" or on your website using a "Share Button." Upon clicking this social media link, current and prospective clients will be taken through to a payment page where they will be prompted to enter their personal details and complete a PAR-Q before becoming your client (if they are not already). Once the payment is processed, the client will be permitted access to the package of online workout and nutrition plans. My PT Hub’s workout and nutrition planning capabilities are robust, but when it comes to marketing, My PT Hub lacks the features that many competitors have. For example, marketing automation is limited, and tools such as lead generation forms and conversion tracking is not available. However, My PT Hub does provide strong personal branding. 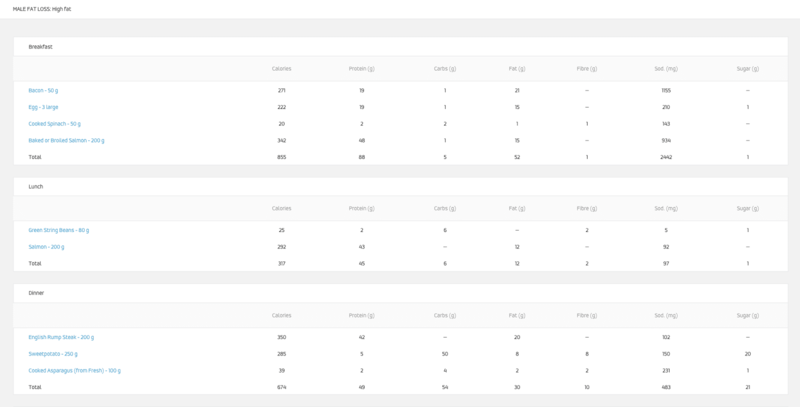 You can insert a logo and customize the colors of your dashboard to match your brand. Also, trainers have the option to pay a one-time fee to upgrade to the branded My PT Hub app, which also includes the ability to personalize the app with business colors and a logo to ensure all clients have a seamless user experience with your brand. The branded app comes at an additional cost for both the PRO and UNLIMITED plans, but is not available with the FREE plan. My PT Hub has gained popularity as a software solution that helps more than 55,000 personal trainers and fitness professionals improve their bottom line. My PT Hub’s robust progress tracking and communication tools make the software useful for mobile fitness professionals that need to work across multiple locations, such as personal trainers, wellness coaches, nutritionists, and physical therapists. However, if you're looking for advanced marketing capabilities and more robust scheduling functionality, then you may want to look into other systems. If you're looking for a lightweight system to help you grow your personal training business, then My PT Hub is an excellent option to consider. Before making a commitment, you can sign up for a free 30-day trial to see if the system suits your needs, and then decide if you want to pay for a premium plan.